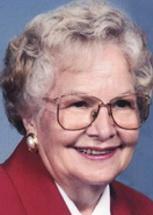 CEDAR FALLS - Mildred L. Arends, 92, of Cedar Falls, died at home Saturday, May 31, 2014. She was born Nov. 24, 1921, in Hudson, daughter of Sophus and Marie Christensen Hermansen. She married John J. Arends on April 13, 1946, at Fredsville Lutheran Church, Cedar Falls. He died March 26, 1998. She graduated from Cedar Falls High School and Pitze’s Beauty School. She was a "Rosie the Riveter" in California during World War II and a self-employed hairdresser, retiring from the Western Home in 1986. Survived by two sons, Ronald E. (Jan) of Brooklyn and Mark J. (Michele) of Cedar Falls; nine grandchildren; 11 great-grandchildren; and two sisters, Elsie Ghrke of Cedar Falls and Gladys Jungling of Zeeland, Mich.
Preceded in death by a sister, Helen Jensen; and a brother, Stanley Hermansen. Services: 10 a.m. Saturday at Nazareth Lutheran Church, with inurnment at a later date in Fairview Cemetery, both in Cedar Falls. Visitation from 4 to 7 p.m. Friday at Richardson Funeral Service and also for an hour before services Saturday at the church. Mildred loved being with her family, playing cards with them and her friends. She enjoyed the weekly Nazareth Lutheran Church luncheon, meals at the Cedar Falls Senior Center, and going for coffee with family and friends. In later years she became a fan of TV basketball and golf.